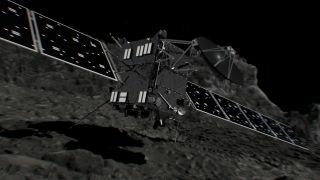 The European Space Agency's Rosetta spacecraft crash-landed on its target Comet 67P, shown in this artist's illustration, on Sept. 30, 2016, ending a historic 12-year mission to explore and land on a comet. This screenshot from ESA's broadcast of the Rosetta spacecraft's crash on Comet 67P shows the signal confirming the crash at 7:19 a.m. ET. on Sept. 30, 2016 at the Rosetta Mission Operations Centre in Darmstadt, Germany. Read our full story here. This particular spot has a number of dust-spewing pits — some 330 feet (100 m) across and 165 feet (50 m) deep — that scientists wanted Rosetta's instruments to observe before the mission ended. The walls of these pits appear dotted with "goosebumps" that could be signatures of early comet building blocks known as cometesimals. The mission has already produced a number of surprising discoveries — that the Comet 67P has big grains of water ice on its surface, molecular oxygen in its coma, diverse landscapes and a fluffy core, just to name a few. But Rosetta scientists still have reams of data to pore over. So, even with today's finale, the work isn't over. Follow Megan Gannon @meganigannon, or Space.com us @Spacedotcom. We're also on Facebookand Google+. Original article on Space.com.